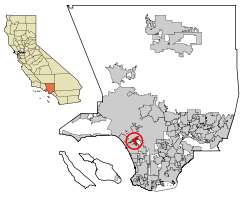 Culver City is a city in western Los Angeles County, California. ↑ "CCGovernment - City Manager". Retrieved 2007-01-18. ↑ "Culver City city, California - Fact Sheet - American FactFinder". Retrieved 2007-01-18. Wikimedia Commons has media related to Culver City, California. This page was last changed on 14 November 2017, at 02:08.